Prominent & Leading Manufacturer from Mumbai, we offer cosmetic retail display kiosk panel. 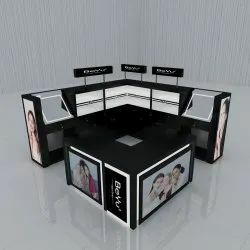 A kiosk is a small, stand-alone booth for business purposes suitable for the opticalindustry. You may utilise these kiosks for a wide array of applications. Our Custom Kiosks are our most comprehensive kiosk solutions. A kiosk is a great way for a first-time customer to educate themselves about your products and services.Our specialization in Kiosks includes concept, design and execution. Using the latest technology and eye for retail design, our Optical Retail Outlets team are experts at kiosk design and recurringly come up with stunning productions for our clients. These kiosks will be designed specifically to your requirements of size, color, shape, budget, and timeframe.